Restoring what’s yours on a cellular level. We are here to help you reach your fullest health potential, so you can live a long, healthy and full life. We look at the whole person and customize a treatment plan for you that will make you feel young, look amazing and restore your energy. We specialize in male and female hormone replacement. Our focus is on you as we provide a customized and personalized approach that maximizes your results. Increase quality of life, regain energy, strength, and age healthier. Through non-invasive testing, we determine the best approach to relieving your pain. From platelet-rich plasma to stem cell treatment and Smartwave technology, we use the most advanced, safest and effective approaches to restoring your health. Our doctors use the latest medical advancements to provide you with the most effective care. They apply chiropractic disciplines to achieve the results you need to live a pain-free and fulfilled life while keeping the treatment to a minimum. PLATELET RICH PLASMA (PRP) AND STEM CELL THERAPY IS ALL-NATURAL, SO YOU CAN BENEFIT WITHOUT THE RISKS AND RECOVERY TIME ASSOCIATED WITH INVASIVE PROCEDURES. THERE IS NO SUCH THING AS “ONE-SIZE-FITS-ALL” WHEN IT COMES TO PHARMACEUTICAL TREATMENT. WE WILL DISCOVER WHAT YOUR BODY NEEDS AND WHAT WORKS BEST FOR YOU. YOUR HEALTH IS OUR FIRST PRIORITY AND THAT BEGINS BY LISTENING TO YOU SO TOGETHER WE CAN GET TO THE ROOT OF ANY HEALTH ISSUE YOU ARE FACING. Dr. Craig Cohen FNP, DC has been helping people live healthier lives for over 15 years using a combination of chiropractic and medicine. He graduated with an honors degree in Biochemistry from Salisbury University. He went on to earn his Doctorate in Chiropractic from Life University. After graduating, Dr. Cohen worked as an associate doctor for several clinics. He moved to Murrells Inlet in 2007 and established an independent practice. He continued his education by graduating with an honors degree in Nursing from Hardin Simmons University. He went on to work as a Registered Nurse in the Emergency Department at Waccamaw Hospital from 2010 to 2012. Finally, he graduated from St. Joseph’s College of Maine with a Master’s Degree in Nursing. 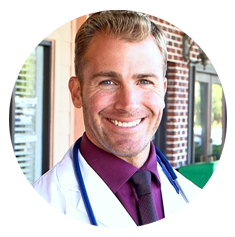 He is dual licensed and board certified as a Chiropractor and Family Nurse Practitioner. He has extensive training in Bioidentical Hormone Replacement Therapy and completed all four modules of World Link training. He lives in Murrells Inlet with his wife Amanda and two daughters, Londyn and Vivien.